The definition of a weed can change from place to place and from person to person, however, the state of Wyoming has identified some weedy plants as “designated noxious weeds.” These plants are “considered detrimental, destructive, injurious or poisonous, either by virtue of their direct effect or as carriers of diseases or parasites that exist within this state…” A list of declared noxious weeds by county can be found HERE. State designated noxious weeds can be found HERE. The majority of designated noxious weeds are non-native, meaning they have their origin in some other region or another part of the world, however, at times native plants can become aggressive due to soil disturbance. At the core of invasive weed control is the belief that our local ecosystems, comprised of soil microbes, plants, and animals, co-evolved to exist in a state which is both stable and resilient. If non-native plant species are allowed to drastically change the native plant composition, the ecosystem is compromised. Prevention really is the best tool for keeping our native plant communities healthy and free of invasives. Property owners of large or small acreages can play a part in keeping invasive plants at bay. Once invasive weeds are established they can be very hard to eradicate. It’s best to control weeds when they first appear on your property. Weed identification is critical to weed control. Not all weeds will respond to the same control measures. Wondering if you have a noxious weed on your property? Check out the COMMON WEED PHOTOS. The Wyoming Weed Identification Site contains statewide photos and is another good resource for identifying weeds. You can also post a photo on our Facebook page and we’ll help you identify the plant in question. To control weeds with herbicides it is important to spray with the correct product, in the correct amounts, and at the correct time. The "shot gun" approach to herbicide application is costly and often ineffective. Improper use of herbicides can also result in weeds becoming resistant to control in the future. Detailed information about herbicide application for control of specific weeds on cropland, rangeland, pasture, and rights-of-way can be found in the Weed Management Handbook; a publication of the Cooperative Extension Services of Montana, Utah and Wyoming. 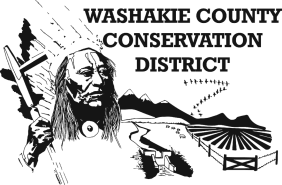 Additional guidance and expertise is available at the Washakie County Weed and Pest at 347-8582. Mechanical control can include pulling, discing, and mowing. Knowledge of the plant's biology is critical to the success of mechanical control. For example; discing of annuals before they set seed can help control them, however discing perennial plants able to reproduce from root pieces may just create a bigger problem! Consult with knowledgeable people before embarking on a weed control plan. Re-establishment of native plants is the ideal goal when dealing with invasive plants on native landscapes. Successfully re-establishing native plants requires a well informed and practical plan. Typically, a season of weed control is needed to begin the process. Whether or not reseeding is needed will depend on the amount and kind of desired plants still present on the ground. Reseeding an area to desired plant species takes careful thought and the willingness to monitor and adjust the plan when necessary. For more help in reducing invasive weeds in our county, contact us at 347-2456.